Couples counseling provides the opportunity for couples at all stages of marriage to deepen their commitment, enhance communication, and strengthen positive behaviors that will help partners cope with issues that frequently impact marriage. Most couples are in some distress by the time they make the call for an appointment. In fact, couples wait an average of seven years after they realize that there are problems in their relationship before entering couples counseling. Yet, they are often surprised at the relief they feel after the first appointment. I have practiced couples counseling for over twenty years, and I am a Certified Gottman Marriage Therapist. I utilize techniques from the work of psychologist Dr. John Gottman, along with methods of interpersonal and Emotionally-Focused Couples Therapy, in a unique way, tailored to each relationship. With a goal of achieving growth in each partner, I integrate these approaches to form my own problem-centered counseling that is active and personalized, utilizing communication skills homework, empathy-building exercises, and techniques to help you create a vision of the marriage you want to have. When a couple comes to couple’s therapy for the first time, emotions are often intense. I approach the first session with an attitude of “no blame.” Using a combination of questionnaires that assess your relationship strengths and problem areas, plus individual interviews with each partner, I will then provide feedback to help create a treatment plan that incorporates your goals for your relationship. Dr John Gottman and his colleagues at the University of Washington conducted extensive research on how real couples interact so they could better understand what causes problems in a marriage and what leads to marital happiness. 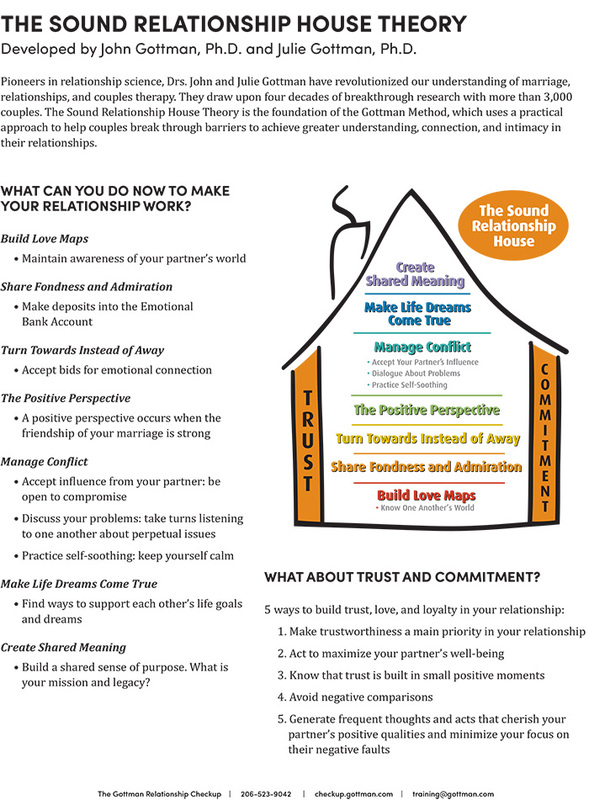 Dr. Gottman identified key components to help relationships flourish. When couples become better friends, learn to manage conflict, and create ways to support each other’s hopes for the future, they protect their relationship from the inevitable stressors and transitions of life. Turn Towards: State your needs. Be aware of bids for connection and turn towards them. The small moments of everyday life are actually the building blocks of relationship. The Positive Perspective: A positive approach to problem-solving helps attempts to repair succeed. Negative perspective darkens our viewpoint. Positive perspective builds hope and good feeling. Manage Conflict: We say “manage” conflict rather than “resolve” conflict, because relationship conflict is natural and has functional, positive aspects. Understand that there is a critical difference in handling problems that are perpetual (likely to persist) and those that are solvable (can be brought to closure). What does it mean when someone is a Certified Gottman Therapist? A Certified Gottman Therapist is an individual who has completed the certification program offered by The Gottman Relationship Institute. I trained with Drs. John and Julie Gottman and am one of fewer than 200 Certified Gottman therapists worldwide. Dr. Susan J. O’Grady is a Certified Gottman Therapist. — Susan J. O’Grady, Ph.D.